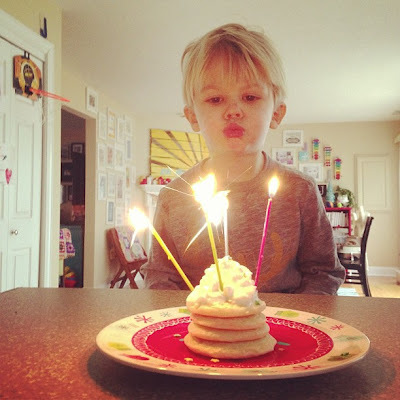 Little Bit Funky: Happy 4th Birthday Aaron! Today is my Aaron's 4th birthday. He's my wild child, my curious little monkey, my climber, my crazy, my bundle of energy, my never ending source of patience building. He's also very sweet and kind and loves a good snuggle. He's in love with babies and animals. He's HUGE and already showing signs of being great at sports. He loves Dalmatians (all named Koufax). His favorite food is blueberries. He hates hot dogs. He goes to school two days a week and loves it. He loves Sunday school and adopts all of our friends as aunts and uncles. He's wonderfully funny and has great joke delivery. He is rambunctious. He is all boy. He is wonderful and awesome. He fills a sweet space in our family and we are so thankful for him. There isn't a day that goes by that he doesn't teach us something new. Our family is complete with him in it. Happy birthday to the original hoho! We are so happy for each and every day of the last four years!